Today I'll be reviewing Benefit's Eye Cream called "It's Potent!". I bought this when I finally ran out of my YSL Youth Liberation eye cream and wanted to try something else. 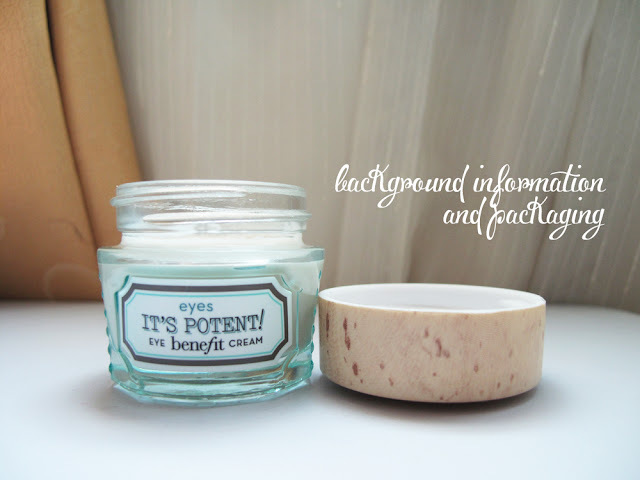 Since I used this at Benefit's Workshop and thought it quite alright, I decided to purchase it and see how it really fares. Your eyes can't keep a secret...they're the first to show signs of age and stress. It's potent! 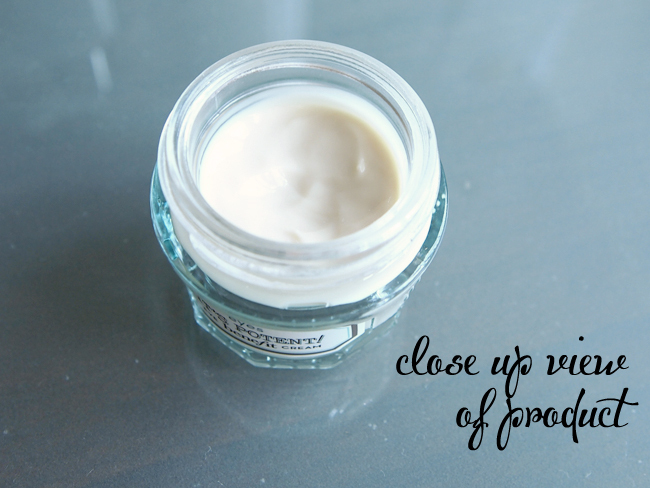 eye cream fades dark circles and helps smooth fine lines for brighter, younger-looking eyes. Contains a peptide complex known to help restore elasticity and firmness, a blend of hydrating botanical extracts including apple extract, known to help boost collagen, and loquat extract, known to help protect the skin from free radical damage. Once again, it is needless to say how cute Benefit's packaging is. I love the cork patterned design on the lid against the cool green blue of the glass bottle. It's a beautiful contrast and looks so rustic yet sophisticated at the same time. Very simple to use as well - just twist open the cap and tadaaa! That's it. However.. I suppose some people might not like some things about it such as: the bottom being breakable and difficult to bring whilst travelling, and that it does not have a spatula so dipping your finger in to get the product out can be kind of unsanitary. These things don't really bother me but I suppose they can be an issue for others. When you first open the bottle and take a look inside, the product looks thick and gooey and everything bad. It looks like a quick and fast road to milia seeds too. But this is where they say you should not read a book a by it's cover, nor judge an eye cream without actually feeling its texture. When actually scooped out and applied, the cream melts like butter and absorbs so quickly into the skin you wouldn't even have noticed it was there just a minute ago. There is no shine nor residual stickiness as well. It's very lush and feels lovely. As you can see from the picture, it has disappeared into the top of my hand with ease. This just took some light patting and after awhile, I'm left with soft and hydrated skin. Well it's very straightforward I feel. Just twist open the cap, dip your fourth finger in, take some product out and pat it under your eye down to the top of your cheekbones, and upwards to your temple and upper eyelid. It's like drawing one huge circle around your eye. I know most people just put it under their eye and stop there, but eye creams are for all-round eye area protection so why limit yourself? This is where I got a little disappointed. I love the texture of this product and just how quickly it settled in without me having to wait before applying my concealer or eye primer of the sort; but as you can see.. there is little to no difference. And the "After" picture was actually taken one week after the "Before" one. I've learnt not to expect too much from this eye cream results wise honestly, but the texture remains one of the best I've ever used. It's really a on-the-fence situation.. I suppose if you have very very young under eye skin with almost no dark rings, then this could be one of your "prevention" creams because this does not appear to be a cure to anything. Younger skin, probably for people hitting their 20's to mid 20's. As mentioned, I think it best to actually start using eye cream when you're 18, but I suppose you could work your way up from drugstore brands first and start on Benefit later on. Sadly... Most likely it's a no. Whilst I have long given up on my dark rings and the situation of my eyes in general, I would still like to know that a product (at the very least) holds up some end of the bargain. Though this one feels lovely and sinks in wonderfully to my eye area, I do not feel that the price is too justified. 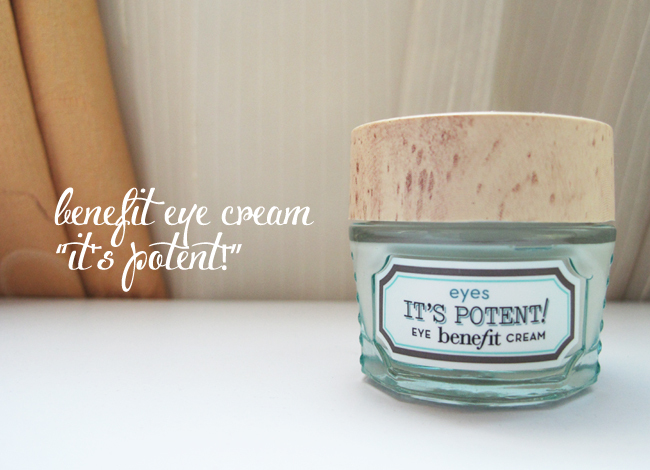 eye cream of the year! How does this compare to the ysl eye cream? Ysl more recommended? Hmm texture wise I prefer this one. Makes makeup application rather easy and quicker. However, judging by results I would say YSL is way better! I can't comment on fine lines because I don't really have any visible ones but this one sure doesnt help with dark rings. Hey I have been looking for a good eye cream, I do have severe dark circles. Although not that much of wrinkles. What would you reccommand? I’m definitely loving the information. I’m book-marking and will be tweeting this to my followers! Outstanding blog and superb design and style.